Stop by and take a look at some of the recent site changes we’ve made. We’ve made two major adjustments on the home page and category pages. 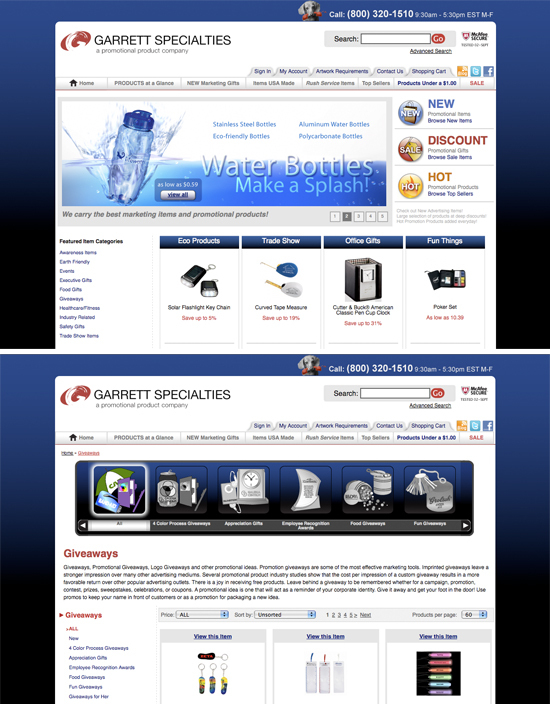 Click on www.garrettspecialties.com and let us know what you think! First, on the home page we strategically moved things around for your benefit. We have updated our homepage without compromising creativity. In fact, we have added to the site’s artistic corporate design with several new elements. We want you to find the promotional giveaways you need fast and easy. The featured product slide show has moved up along with the new, discount and hot buttons. That way you will always know what’s on sale, what’s new, and which items are top sellers. Then we chose four popular promotional product categories and display six items at a time for each. By reducing the need for excessive scrolling and searching, you find the item you need with speed and ease. Also checkout the new upper right hand corner of every page! Find resourceful links with our new easy to spot three-dimensional tabs! Second, we have added a really cool advanced feature to the category pages. A new and stylish horizontal interactive slider filled with colorful graphical icons will assist you as you browse through each category. The color in these icons is activated when a category is selected. Suddenly the monotone image becomes a colorful display with an illuminated background. The slider is engaging, fun and highly functional. Now you can easily associate the icons with the product category they are looking for. We believe our high quality design visually communicates a little bit of our personality as well as cater to your promotional product needs. We hope you enjoy your user experience at https;//www. GarrettSpecialties.com!